Encephalitis; Status Epilepticus; Hashimoto Disease. We present a case of a 38-year-old woman who was at eight weeks of gestation and was admitted to Sultan Qaboos University Hospital with refractory status epilepticus (SE). She presented with a two-day history of fever and a depressed level of consciousness that was followed with generalized tonic-clonic seizures. She progressed to refractory SE that required intubation and mechanical ventilation. Autoimmune workup was suggestive of Hashimoto’s encephalopathy (HE) as suggested by the high levels of thyroid antibodies. Her magnetic resonance imaging showed bilateral hippocampal and basal ganglia hyperintensities, and electroencephalogram showed bilateral frontal epileptiform discharges. Other autoimmune workup was negative. Intravenous anesthetics were started including propofol, midazolam, ketamine, and thiopentone. She was started on multiple immunosuppressive therapies. Multiple antiepileptics were used including phenytoin, lamotrigine, levetiracetam, sodium valproate, clobazam, phenobarbital, and lacosamide. The outcome was unusual in terms of refractoriness to immunotherapy treatment despite a confirmed diagnosis. We did a literature review of all cases with HE presenting with SE with their clinical characteristics and outcome. A 38-year-old woman was transferred to Sultan Qaboos University Hospital with a diagnosis of refractory status epilepticus (SE). At the time of presentation, she was eight weeks pregnant. She presented with a two-day history of fever and abdominal pain followed by a one-day history of depressed level of consciousness and generalized tonic-clonic seizures. There was no family history of seizure disorder, thyroid, or autoimmune disease. She progressed to generalized SE, which required intubation and mechanical ventilation. She was started on intravenous (IV) anesthetics and phenytoin. Her temperature at initial examination was 38 oC. There were no signs of meningeal irritation, and her pupils were mid-position and reactive. An obstetrical examination revealed an empty sac consistent with an abortion. Figure 1: Magnetic resonance imaging showing pattern of bilateral symmetric increased signal hyperintensity of the hippocampal formation. There is increased signal intensity within the caudate nuclei and lentiform nuclei, which is associated with diffusion restriction. Her investigations revealed normal complete blood count, serum electrolytes, and calcium profile. Cerebrospinal fluid showed three white blood cells, elevated proteins (0.96 g/L), normal glucose, and negative cultures. Computed tomography (CT) of the brain was normal while CT venography excluded venous sinus cerebral thrombosis. Magnetic resonance imaging (MRI) showed hyperintensities in the hippocampal region as well as bilateral basal ganglia [Figure 1]. An electroencephalogram (EEG) on admission showed continuous generalized frontally dominant rhythmic epileptiform discharges consistent with SE [Figure 2]. This pattern was resistant to sensory stimuli and would occasionally, and transiently, responds to IV midazolam. Thyroid peroxidase antibodies were positive (222 IU/mL). Another autoimmune workup was negative (including anti-Hu, anti-NMDA, anti-GAD65, ANA, and antiphospholipid). Viral screen was also negative including herpes simplex virus, polymerase chain reaction, and West Nile virus. The patient was initiated on IV acyclovir empirically (until the exclusion of herpes encephalitis) with multiple sequential anticonvulsants including phenytoin, lamotrigine, levetiracetam, sodium valproate, clobazam, phenobarbital, and lacosamide. However, they failed to completely suppress the seizures. After 48 hours of admission, she continued to have breakthrough uncontrollable seizures. Multiple IV anesthetics were used, including midazolam, propofol, ketamine, and thiopentone. Burst suppression was initially achieved, but seizures recurred during IV anesthetics withdrawal. On day two after admission, IV methylprednisolone 1 g was initiated for five days. There was no notable response. IV immunoglobulin was also given for five days. Five sessions of plasmapheresis were started. There was still failure of seizure control with episodes of two to three tonic-clonic seizures per hour. Eventually, the course was complicated with pseudomonal sepsis with multiple organ failure. She died on day 18 after admission. Figure 2: Electroencephalogram of status epilepticus showing continuous generalized, fairly rhythmic epileptiform discharges. The discharges were not responsive to any sensory stimulation. The hallmark of diagnosing HE is the presence of antithyroid antibodies.1,15 The most common antibody identified is antithyroperoxidase (anti-TPO) formerly known as antimicrosomal antibodies.15 It is found in most patients with HE. The second antibody commonly found in HE is antithyroglobulin (anti-TG),15 which is found to a lesser extent. Anti-alpha anolase is another antibody that can be diagnostic of HE.16 In one study, five out of six patients with HE were positive compared with 25 control patients with encephalopathy.16 In our patient, the diagnosis of HE was based on the exclusion of all other causes and the presence of anti-TPO with a level of 222 IU/mL. It is not clear in the literature what level is considered abnormal or diagnostic, as there is variability in the sensitivity and reference range.17 The reference range in our laboratory is 0–50 IU/mL. Other paraneoplastic and autoimmune antibodies were negative. The mainstay of treatment of HE is corticosteroids. The majority of cases show remarkable response with good outcome after treatment with pulse methylprednisolone.13,15 Other modalities of immunotherapy used in HE are plasmapheresis and IV immunoglobulin.5,19 However, although there are cases where those modalities were used, the long-term outcome is uncertain.19 In our case, there was progression of SE despite the use of IV immunoglobulin and plasmapheresis. This was most likely a state of SE refractoriness rather than a failure of a treatment targeting HE. Table 1: Summary of reported cases of Hashimoto’s encephalitis presenting with status epilepticus, investigations, and treatments. 1 g × 2 days, 500 mg × 3 days. CSF: cerebrospinal fluid; EEG: electroencephalogram; MRI: magnetic resonance imaging; Anti-TPO: antithyroperoxidase; Anti-GT: antithyroglobulin; IV: intravenous; IVIG: intravenous immunoglobulin. HE should be considered in patients admitted with SE. Thyroid antibodies should be among the panel of investigation. 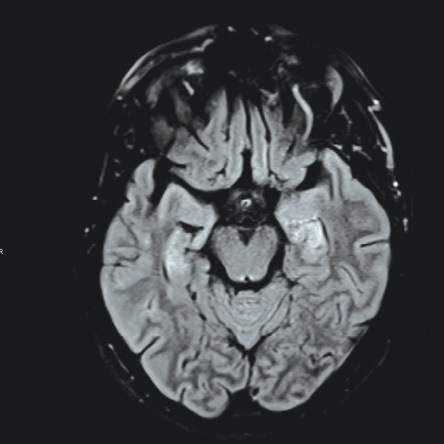 While the overall prognosis is good, this case report demonstrates that severe progressive encephalopathy, particularly with refractory SE in such patients, may have a fatal outcome. However, prompt treatment with corticosteroids should be initiated before the period of super-refractoriness sets in. 2. Ferracci F, Bertiato G, Moretto G. Hashimoto’s encephalopathy: epidemiologic data and pathogenetic considerations. J Neurol Sci 2004 Feb;217(2):165-168. 3. Tsai M-H, Lee L-H, Chen S-D, Lu C-H, Chen M-T, Chuang Y-C. Complex partial status epilepticus as a manifestation of Hashimoto’s encephalopathy. Seizure 2007 Dec;16(8):713-716. 4. Monti G, Pugnaghi M, Ariatti A, Mirandola L, Giovannini G, Scacchetti S, et al. Non-convulsive status epilepticus of frontal origin as the first manifestation of Hashimoto’s encephalopathy. Epileptic Disord 2011 Sep;13(3):253-258. 5. McGinley J, McCabe DJ, Fraser A, Casey E, Ryan T, Murphy R. Hashimoto’s encephalopathy; an unusual cause of status epilepticus. Ir Med J 2000 Jun;93(4):118-119. 6. Bektas Ö, Yılmaz A, Kendirli T, Sıklar Z, Deda G. Hashimoto encephalopathy causing drug-resistant status epilepticus treated with plasmapheresis. Pediatr Neurol 2012 Feb;46(2):132-135. 7. McKeon A, McNamara B, Sweeney B. Hashimoto’s encephalopathy presenting with psychosis and generalized absence status. J Neurol 2004 Aug;251(8):1025-1027. 8. Striano P, Pagliuca M, Andreone V, Zara F, Coppola A, Striano S. Unfavourable outcome of Hashimoto encephalopathy due to status epilepticus. One autopsy case. J Neurol 2006 Feb;253(2):248-249. 9. Ferlazzo E, Raffaele M, Mazzù I, Pisani F. Recurrent status epilepticus as the main feature of Hashimoto’s encephalopathy. Epilepsy Behav 2006 Feb;8(1):328-330. 10. Cantón A, de Fàbregas O, Tintoré M, Mesa J, Codina A, Simó R. Encephalopathy associated to autoimmune thyroid disease: a more appropriate term for an underestimated condition? J Neurol Sci 2000 May;176(1):65-69. 11. Kothbauer-Margreiter I, Sturzenegger M, Komor J, Baumgartner R, Hess CW. Encephalopathy associated with Hashimoto thyroiditis: diagnosis and treatment. J Neurol 1996 Aug;243(8):585-593. Chaigne B, Mercier E, Garot D, Legras A, Dequin PF, Perrotin D. Hashimoto’s encephalopathy in the intensive care unit. Neurocrit Care 2013 Jun;18(3):386-390. 12. Duffey P, Yee S, Reid IN, Bridges LR. Hashimoto’s encephalopathy: postmortem findings after fatal status epilepticus. Neurology 2003 Oct;61(8):1124-1126. 13. Chong JY, Rowland LP, Utiger RD. Hashimoto encephalopathy: syndrome or myth? Arch Neurol 2003 Feb;60(2):164-171. 14. Tan RY, Neligan A, Shorvon SD. The uncommon causes of status epilepticus: a systematic review. Epilepsy Res 2010 Oct;91(2-3):111-122. 15. Mocellin R, Walterfang M, Velakoulis D. Hashimoto’s encephalopathy : epidemiology, pathogenesis and management. CNS Drugs 2007;21(10):799-811. 16. Fujii A, Yoneda M, Ito T, Yamamura O, Satomi S, Higa H, et al. Autoantibodies against the amino terminal of α-enolase are a useful diagnostic marker of Hashimoto’s encephalopathy. J Neuroimmunol 2005 May;162(1-2):130-136. 17. Sinclair D. Analytical aspects of thyroid antibodies estimation. Autoimmunity 2008 Feb;41(1):46-54. 18. Henchey R, Cibula J, Helveston W, Malone J, Gilmore RL. Electroencephalographic findings in Hashimoto’s encephalopathy. Neurology 1995 May;45(5):977-981. 19. Olmez I, Moses H, Sriram S, Kirshner H, Lagrange AH, Pawate S. Diagnostic and therapeutic aspects of Hashimoto’s encephalopathy. J Neurol Sci 2013 Aug;331(1-2):67-71.